Merged with aged infused tobacco blends from the Dominican Republic and Nicaragua rolled up perfectly inside an Ecuadorian Habano wrapper. 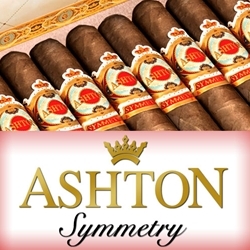 Ashton Symmetry hand-rolled premium cigars are the collaboration of the Ashton and Arturo Fuente brands. This partnership produced a medium to full body smoke that consist of a well-proportioned blend offering sweet notes of cinnamon, caramel, and a hint of white pepper on the finish. The unique taste and exceptional smoking experience is what makes the Ashton Symmetry line a great addition to your "must smoke" cigar list. Find out what cigar enthusiasts already know and stock your humidor full with any of the premium hand rolled cigars listed in our online store below. If you looking for a great smoke at a great price, the Ashton Symmetry’s are hand rolled premium cigars that deliver time and time again. Smokers Discounts has made it easy and affordable to buy premium cigars online. Each of these styles, sizes and flavors are in stock and available at a low discount price. Call us for more details!